The P1000 is a loveable beast and an optical marvel, but it’s difficult to recommend. Max zoom is rarely required in real world shooting, and the optic necessitates a small sensor with underwhelming image quality. Even so, if you’re going on safari and can’t carry - or stretch to - a super-telephoto DSLR set-up, the P1000 may just be worth the money. 125x optical zoom. Yes, you read that correctly. The Nikon Coolpix P1000's lens is capable of covering 24-3000mm (scaled to 35mm camera figures), making it by far the most zoom range available on a consumer camera. Given the old Coolpix P900 already held the optical zoom range record at 83x, it's come as some surprise that Nikon has seen fit to obliterate its own record. We examine this new ultra-zoom bridge camera benchmark to see if there's more to the P1000 than just big numbers. The P1000 is all about its lens. The 24-3000mm-equivalent optic has a variable f/2.8-8 aperture, as well as lens-shift Vibration Reduction - essential when exploiting the far reaches of the zoom range. Behind the lens is a 16MP sensor, but despite the big DSLR-like appearance of the P1000, the sensor is about the size of that inside a camera phone. Therefore don't expect the P1000 to be setting any image quality records. Its limited ISO 100-6,400 sensitivity range is indicative of the sensor's tiny dimensions, though you can shoot stills in raw. 4K video is also available, albeit at a maximum of 30 frames per second. There's a selection of twenty image effect filters, plus dedicated shooting modes for photographing distant subjects like the moon and birds. Externally, the P1000 sports a 3.2-inch articulating monitor, though this isn't touch-sensitive. There's also a high resolution 2,359k-dot OLED electronic viewfinder, and a hot shoe for mounting accessories like an external flashgun. Wi-Fi and Bluetooth connectivity enable remote camera control and wireless image sharing via Nikon's SnapBridge app, as well as allowing the P1000's images to be location tagged using your smart device's GPS. As you'd expect for a camera boasting the kind of zoom reach to make a paparazzi snooper green with envy, the P1000 isn't exactly compact. With dimensions of 146 x 119 x 181mm, it's similar in size to a full-frame DSLR equipped with a 24-70mm f/2.8 lens, but with much more girth around what would be the lens mount. All this bulk does at least make the P1000 a comfortable camera to hold, with a well-sculpted grip and generous area to rest your thumb, though build quality feels a little hollow and not quite on par with a DSLR. The selection of rear buttons (and basic menu interface) are also more in-keeping with a Coolpix compact camera than something like a Nikon D3500, but there is a PASM mode dial to easily select shooting modes, and a control wheel for adjusting key settings. The flip-out 3.2-inch, 921k-dot monitor is a match for an entry-level DSLR in terms of clarity, but it lacks touch-sensitivity, which stings considering the P1000’s hefty price tag. Thankfully Nikon hasn’t skimped on the 2359k-dot OLED EVF, as this is a pleasure to use. The only minor issue is there can be a slight but sometimes frustrating delay before it activates via the automatic eye sensor. Fire up the P1000 and first impressions are positive. Despite not having any phase-detection points, the AF is near instantaneous and reliably accurate at shorter focal lengths, and it rarely struggles to lock on even when the zoom reaches an equivalent 1000mm. But plough on to 2000mm and beyond and the AF can miss its mark, sometimes hunting several times for accurate focus. The lens could really benefit from a focus limiter switch to lock out short focal lengths when you’re zoomed in. Instead there’s a snap-back zoom button that enables you to zoom out to relocate a fleeting subject and zoom back in, all at the touch and release of button. There’s also a customisable control ring around the front of the lens barrel, but annoyingly this can’t be used for manual focus to override any AF uncertainty. It’s not just the AF that struggles to cope with the immense zoom reach. The P1000 packs an excellent lens-shift VR system that performs admirably up to around 1500mm, but beyond this you’ll need a statuesque stance - or tripod - to ensure a sharp shot. Bright conditions are also a must, as the lens stops down to a maximum f/8 aperture at longer focal lengths. This wouldn’t be a problem if you could keep shutter speeds high via increased ISO sensitivity, however do this and image quality takes a tumble. The P1000’s sensitivity range tops out at ISO 6400, but the tiny 16MP sensor struggles to maintain good detail and dynamic range even at ISO 800. We compared the P1000 to a 2016 Google Pixel XL phone for wide-angle image quality. Not exactly an apples-to-apples comparison, but it's interesting to see how a the big Nikon performs relative to a camera that fits in your jeans' pocket. Check out the comparison gallery below. The P1000 comes close to the smartphone for daylight low ISO image quality, but phone trounces it in dimmer conditions, resolving far more detail despite only packing a 12MP sensor compared to Nikon's 16MP chip. 16MP is enough to score fairly well in our resolution tests, but image noise quickly compromises fine detail as sensitivities increase. It’s also worth noting the significant chromatic aberration clearly visible across our high-contrast test chart. Predictably for a small sensor with a high pixel count, light sensitivity is poor and image noise high. A D3400 runs rings around the P1000 for a fraction of the cost, and the same money could even buy you the stellar D7500, albeit body-only. At ISO 100 the P1000 is capable of good highlight and shadow reproduction, but things quickly deteriorate once you pass ISO 400. By contrast, a D7500 manages as much dynamic range at ISO 102,400 as the P1000 does at ISO 6,400. The Nikon P1000 is a bit like an exotic supercar. Its design is focused solely on achieving big numbers, yet you'll rarely take it to the max, but will still have to forgive its everyday inconveniences. In our testing we never needed more than 1500mm-equivalent reach to fill the image frame with our subject. While it's nice to have the bragging rights that extra zoom is on tap, we'd prefer a more balanced camera with a bit less reach, but a smaller body containing a bigger sensor capable of better image quality. We still love that Nikon has built such an incredible showcase of its optical engineering, even if the P1000 is a compromised beast that's targeted at a very niche market. If you can still find a Coolpix P900, it'll likely be around half the price of the P1000, yet its 83x zoom is still plenty for almost all occasions, and image quality differences will be negligible. Oh, and the P900 is also significantly smaller and lighter than its replacement. 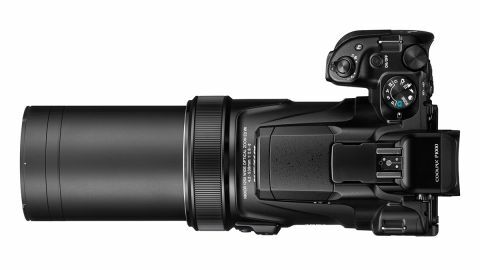 Canon's latest SX70 HS superzoom bridge camera sports a 65x zoom (21-1365mm) lens. It won't match the P1000's moon-capturing ability, but its reach will capture most earthbound encounters. It's also fairly compact at 127 x 921 x 117mm, and its 610g weight is under half that of a P1000. The FZ2000 sacrifices outright focal range in favour of a much larger, 1-inch-type image sensor. You still get 20x optical zoom though, and the FZ2000 should set you back slightly less money than a P1000.